Looks like we’ll be on a little “Eastside L.A. kick” for a few days. Hands actually began in Philadelphia with Geoff Halliday on vocals and keyboards and Ryan Sweeney on guitar, but then migrated to Silver Lake, where Sean Hess (drums) and Alex Staniloff (bass) joined them and all apparently partook of those mystical underground spring waters that make bands in this particular neighborhood of Los Angeles really, really good. This is exuberant synth pop that wouldn’t be unwelcome by fans of Passion Pit, Foster the People — or the 1980s, for that matter. This is some good bouncy stuff for moving around to in a sweaty club. Although they only just became a band last year, they’ve already played at SXSW, CMJ and DeLuna Fest, and have had some considerable mainstream media attention. 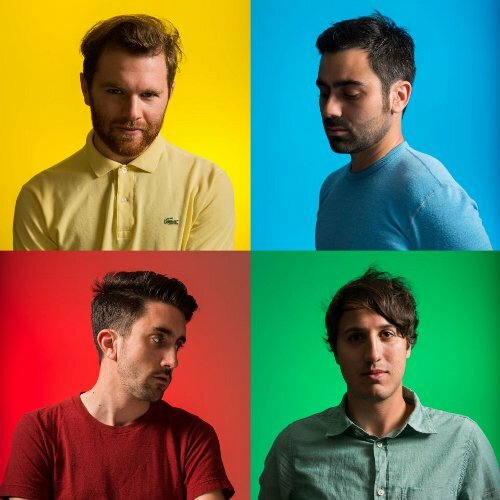 This includes ABC News’ “7 Emerging Artists On The Rise,” The Guardian’s “New Band Of The Day” and Time Magazine’s list of “11 bands you don’t know (but should).” Last month, they released their debut full-length, Synesthesia on Kill Rock Stars. One stand-out track for me is “Brave Motion,” which also comes with a pretty awesome video. Check it out. 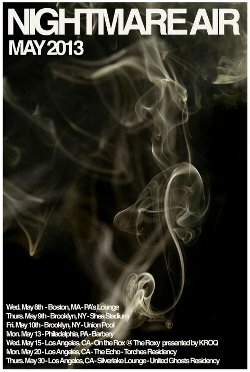 They’ll be stopping off in Boston (Allston) at Great Scott on Tuesday night. See their East Coast tour dates below. And speaking of Passion Pit, living in the Boston area as I am, I would be remiss in not including Hands’ remix of Passion Pit’s “It’s Not My Fault.” So here it is. 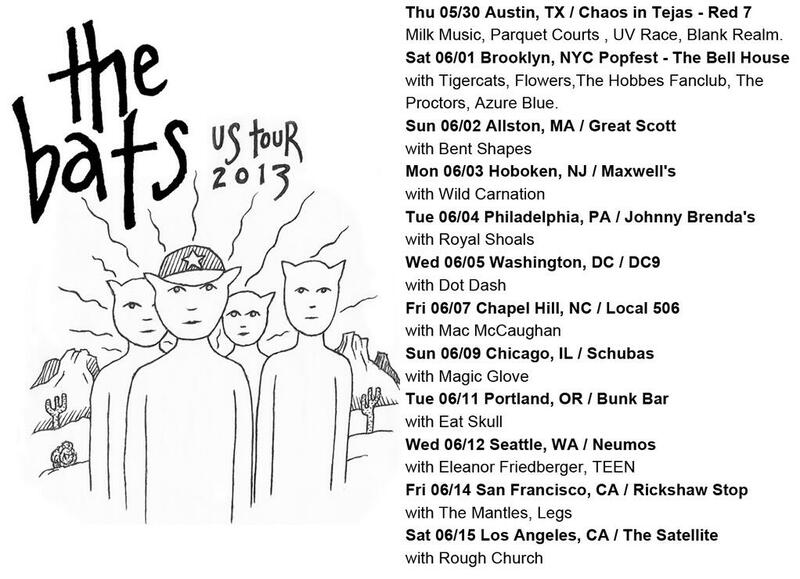 The Bats – Spring 2013 U.S. Tour! 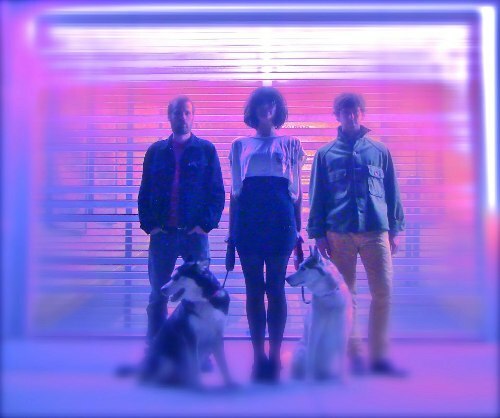 Heads up, New Zealand Flying Nun indie pop fans! We have a real treat coming right up on the horizon. 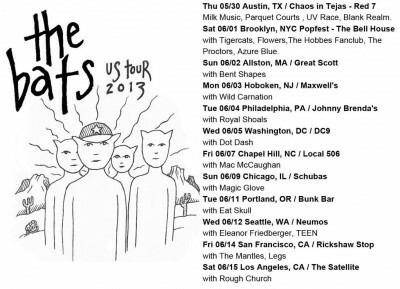 Direct from Christchurch, The Bats are here for a 12-date tour across the U.S., stopping off in Boston at the cozy Great Scott this Sunday (June 2). Not only are The Bats one of the legendary bands from back in those heady ’80s. Along with bands like The Clean, The Chills and The Verlaines, they defined that classic “Flying Nun sound” — pretty, chiming, jangly guitar-based pop music that dances happily around positively dismal lyrics. Love it. Here’s a little departure for me from what I typically post, but I really like this one. It’s the new single from Starlight Girls, which was produced by Xiu Xiu’s Jamie Stewart. This song is the A-side of a glow-in-the-dark star wheel 7″ record that they’re putting out on Brooklyn-based Ooh La La Records. Try this one out for a sultry and sensuous groove in which to begin your week after the long holiday weekend. Niiiiiice. P.S. 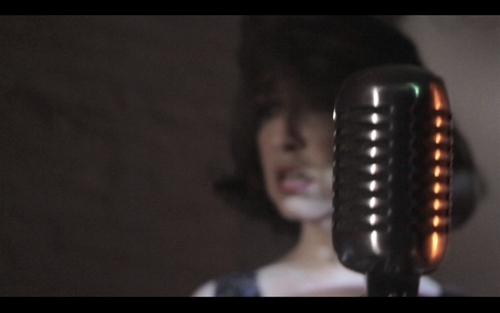 to NY’ers – they’ll be at Glasslands Gallery in Brooklyn on 7/2. Boston Calling ~ May 25 & 26 ~ welcome to the city’s first rock festival! So I would be remiss in not acknowledging and commemorating the City of Boston’s very first music festival. 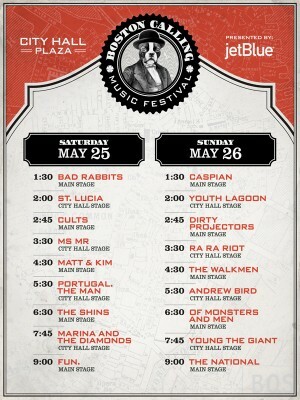 Boston Calling is a 2-day extravaganza being held May 25 & 26 at City Hall Plaza, right in the center of Boston. For anyone who attended WFNX’s ‘Best Music Poll’ show back in 2009, this is a really cool location for live music. They also happen to have a pretty stellar line-up, no doubt due to the involvement of the National’s Aaron Dessner, who helped to curate. There are two local bands on the bill as well (which doesn’t always happen at these sorts of things — instrumental group Caspian (from Beverly) and Bad Rabbits (from Boston). Unfortunately, after I’ve just hyped it like that, regular tickets and passes are completely sold out. However, if you’re well-heeled and enjoy the ‘Rock Star Treatment,’ you can still get single day or weekend VIP passes, which include your own entrance, VIP lounge access, food and a private bar, private restrooms and some festival swag. See the line-up below and check out a few of the featured artists performing. Happy Festival, Boston! 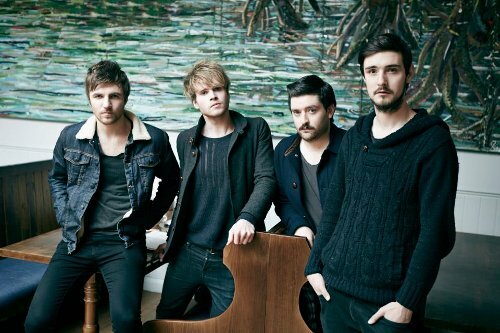 Just a quickie this morning to say how excited I am to see another band this evening… Kodaline. They’re from Ireland, they sound very lovely, and they’re opening up the show for The Airborne Toxic Event tonight. I’m pretty sure the show is sold out, but you might want to check Ticketmaster, as a handful were recently released. Check out this amazing song and video from Kodaline, and if you’re going tonight, be sure to get there early to the House of Blues so you can see this fine band. Doors are at 7pm, show at 8. Ah, the ups and downs and overall strangeness of being in an indie rock band. One day, it’s supporting The Airborne Toxic Event in big sold out love fests and the next, it’s a hard slog middle slot at the living room-sized P.A.’s Lounge in that hipster enclave, Somerville. Actually, I think P.A.’s knocked a wall down recently, so make that a large living room. If you need to have your face melted with a densely layered psychedelic-tinged full-on noise party, Nightmare Air can most definitely help you out. 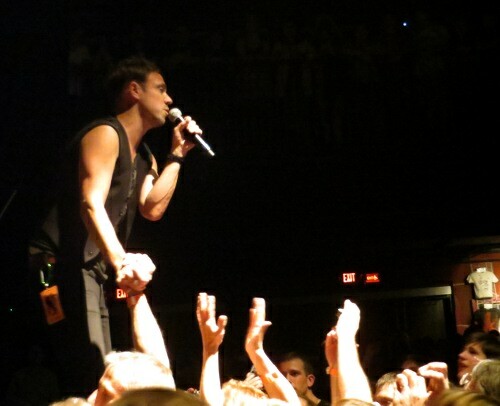 They released their debut album back in March, and have some East Coast and West Coast dates planned for this month. Go see them. At P.A.’s they’re listed as second band up after Joe Turner & the Seven Levels. Tennis System is headlining. For now, turn up the volume on the video below, and imagine what this will sound like in a small room. Yowsa.